Monica Juneja in the preface to Simone Wille’s book “Modern Art in Pakistan” asks if a history of modernist art that goes beyond being a set of ‘responses’ to European master narratives be conceived? I admit this question intrigues me. There is of course a growing scholarship regarding a ‘revisionist historiography’ that shifts the locus from the West to elsewhere. Could this ‘elsewhere’ be our locale? Could this retrospective article on Anwar Jalal Shemza’s art and life lead us to unapologetic acceptance of pre-colonial, colonial and post colonial patterns in thought and behavior? Simone Wille observes that modernist artists in Pakistan largely draw on “memories-available through textual and visual records-of the Mughal and Persianate Worlds” and seek to articulate a cultural imagery in order to create links with a ‘transcultural past’ in a bid to construct a sense of self and locality. (Wille). Before bringing Shemza’s art into the forefront, let’s look at another idea. Homi. K. Bhabha talks of a ‘double perspective’ regarding the colonial and post- colonial narratives regarding creativity. ( in conversation with Susan. S. Bean. (Midnight to the Boom; Painting in India after independence). The said double perspective accepts the situation of unfreedom, lack of rights, demoralization, and dehumanization of people in a colonial set up and yet it suggests the creation of certain opportunities for creativity as an agent of change in times of repression, cultural and political pressures. In my view, this model could be of help in studying Shemza’s art, especially in Britain. Revisiting Shemza’s oeuvre in search of fresh historical, intellectual and artistic enquiry is a just cause. The idea of this Retrospective is not to break down or look at the ‘deconstruction’, ‘configuration’, ‘re-configuration’, or the ‘rhythmic linear arrangements’, ‘stylistic’, ‘symmetrical’, ‘asymmetrical’ in his art. This retrospective article is a quest and an attempt to look and contextualize the ‘new kind of art, artists and aesthetic values’ (Thakurta) in order to rethink, redefine, resituate and broaden the areas of enquiry. The question to ask today is if Shemza can be accepted as the harbinger of new thoughts in Pakistani art. Can his importance be reasserted for a new audience, a newer generation? A close look at Shemza’s images points to the “conscious rediscovery and reformation of ‘tradition’ (Thakurta, p.3), resulting in a ‘new aesthetic’. So while there was criticism on Chughtai that he was always in a past world, many others were following suit in the new world order where ‘identity crises’ reigned supreme. Shemza was a prominent one amongst them. Akbar Naqvi credits him,”….Shemza created his own arabesque, something quite unique in art, and certainly singular in the history of Pakistani art”. (Naqvi, p.282). In this retrospective I would be presenting various critiques on Shemza’s work thereby trying to look at his life/work through a multi-angled lens of revisionist historiography. In the Lahore of late 1930s and 1940s, modern movement was gaining momentum, the old guard or the seasoned lot such as A. R. Chughtai, Ustad Allah Bakhsh, S. N. Gupta, Soba Singh and Mian Mohammed Hussain were making way for a younger generation of asrtists. The new artists fast gaining recognition included Sheikh Ahmed, M. Lateef Chughtai, B. C. Sanyal, Satish Gujral, Ozzir Zuby and A. R. Riaz. Partition of India in 1947 slowed down the art activities. Chughtai and Allah Bakhsh retained their position as figures of authority in the new country. Prof. Ijaz Ul Hasan in his book “Painting in Pakistan” states,” the more spirited and ambitious young artists, however, found the prevailing atmosphere at Lahore, sterile and stifling. Intellectually, they could not relate to the hackneyed work and views of their older contemporaries and patrons. Prof. Ijaz Ul Hasan writes that Shemza, an almost established writer in the early 1950s, was part of the post-independence generation of painters who were “radical in their outlook and infused with an aggressive enthusiasm.” and believed that “traditions could not be kept alive by kinetic simulation of the past, but by the artists’ awareness of change and perception of contemporary realities.” In a bid to break free from the past and propagate their fresh perspectives, a few young painters including Moyene Najmi, Ali Imam, A. J. Shemza, Ahmed Pervez, S. Safdar, Razia Feroze and Miriam Shah organized themselves into a group in the 1950s. This group was the famed Lahore Art Circle. Shaker Ali delved into writing alongside his art and so did Shemza. Shemza was a much published writer and a regular visitor to the Halqa meetings at the Pak Tea House. These meetings have been recorded fondly by the likes of Intizar Hussain, A. Hameed and many others. The independence from British colonial rule and partition of Indian sub-continent in 1947 was a transaformative moment for artists too. Overnight two new identities were created; Indian and Pakistani. And it was Shemza’s first migration. In the artist community as the inheritors of this new post-colonial state, the immediate urge for modernism or modern art came out of an aspiration. The aspiration was to create a progressive homeland and possibly a mindset too. The past was suddenly another country. …Shemza migrated from Pakistan just after eight years of its creation. From the late 1940s until the mid-50s he remained a prolific writer, poet and an editor. 1950s were a time of new beginnings but also a time that later generated huge disappointments. Many notable artists left for greener pastures, in terms of guidance, clarity and inspiration, to the West especially England. Influences on Shemza’s Art Practice. Shemza was born in an atmosphere where art and stories of Amrita Sher Gil (1913-1941) were still fresh in the Lahore Art scene. Chughtai and Allah Bakhsh’s art was accessible to the initiated, the galli coochas of Lahore’s walled city retained many artists and craftsmen. Marcella Nesom Sirhandi’s unpublished dissertation on Chughtai states that the most obvious western stylistic influences prevalent at the Mayo School of Art from the time of John Lockwood Kipling through the 1920s was the European New Arts and Crafts movement and Art Nouveau. “The forms of these movements blended easily with Islamic geometric and floral designs that had long been part of the repertoire of Muslim artists in the Punjab.” (p.18). His early influences gave way to more rigorous and deep processes of mashq. A routine that his daughter, Tasveer Shemza, points to as she talks about him being intense and working round the clock. In the remoteness of the country he chose to reside in, calligraphy was perhaps his only connection to his identity. And he held it very close and dear. His constant referencing of architectural elements, the walls and gates of Lahore, merger of calligraphic form and Islamic architecture with a western sensibility of abstraction make him a man who belongs yet longs. The post world war II movement of dissociating with colonial mindset was still in its infancy when Shemza decided to move to England. A major support in Shemza’s struggling years in London were the four” trail-blazing” art galleries committed to showing international avant-garde to the British audience. These galleries are accredited in defining “London as a centre for radical artistic expression.” ( Tate Gallery’s website). “On arrival in London, Shemza, a buoyant “post-colonial intellectual” and celebrated artist with several successful solos to his credit, was soon hit by the shock of the new. Other than cultural alien-ation it was Slade professor and prominent art historian Ernst Gombrich’s opinions regarding the art of the non-West, especially his lecture classifying Islamic art — an art which was labelled as “func-tional” (see Gombrich’s The Story of Art) — that totally devastated the young artist.”, Salwat Ali writes in Dawn in 2016, reviewing the book/catalogue on Shemza’s life/work edited by Iftikhar Dadi. His chosen displacement in a way acted as a facilitator towards looking at his previous practice that was largely ‘figurative’ bordering on ‘illustrative’, critically. As a result of this critical enquiry, in London his work developed towards an abstraction that fused Islamic motifs and calligraphic forms with western abstraction. In the later months of 1958, as the Mayo School of Art was preparing to be reorganised into the National College of Arts, Anwar Jalal Shemza, Ahmed Parvez, Murtaza Bashir, Saifuddin Ahmed and Ali Imam formed the ‘London Group’ and were finally offered an exhibition at the Woodstock Gallery, London. “Their aims were idealistic: to project art from Pakistan and introduce contemporary Pakistani artists to a wider audience.”, Marjorie Husain observed in her monograph on Ali Imam, but the aims were more complex than these as G. M. Butcher, art critic noted. “…they are interested to take part in the self-conscious revival of traditional forms, nor to copy, as such, methods and problems of European painting, old or new. 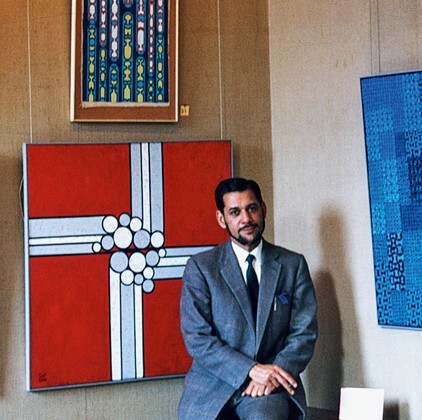 But, equally, as they are not on the edge of the de facto frontiers of their particular cultural situation, there are no rules for them to follow.” Nonetheless he was hopeful towards finding tendencies toward the future of painting not just in Pakistan, but also the newly emerging Muslim countries such as Morocco and Indonesia etc. (Husain). While British art educator and critic John Thompson felt that this formulation of a personal art base from foreign models by the Pakistani art communitywas problematic. (Sirhandi, p.48). According to some artists-writers, Shemza, in his London years, was re-introduced to “geometry and spatial order” that was already a part of his inheritance. (Hashmi & Mirza). Finally in England, Shemza experienced the modern movements in art firsthand. 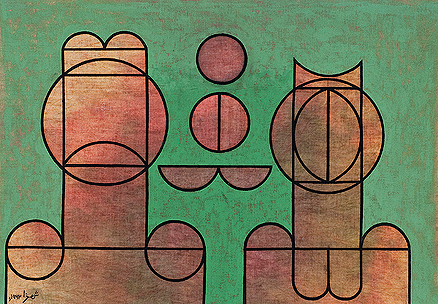 Armed with his earlier influences and inspirations namely Islamic calligraphy, carpet designs and Paul Klee as his guiding light, he set out to establish a “vigorous and disciplined practice”. “His Roots series, executed in the mid-1980s at the end of his life, relays the anguish of diaspora in a formally restrained language based on calligraphy and ornamental designs of Oriental carpets and textiles.” (Dadi). “Later he would combine the simplified formal language of these artists with Islamic architecture and calligraphy to create his own style. Or as he put it: ‘One circle, one square, one problem, one life is not enough to solve it.’”, writes Asphra Shemza, his granddaughter. His London years are interspersed with occasional exhibitions with other fellow ‘commonwealth’ artists such as F. N. Souza, Avinash Chandra at progressive galleries like Gallery One and the New Vision Centre in late 1950s. Having married Mary Taylor, a fellow artist in 1958 and starting a family in 1958, Shemza sough regular modes of income and relocated to West Midlands to begin his teaching career at Stafford College. It was an existence in isolation from the London art scene. Neverthless he continued working rigorously and exhibited internationally in many biennials till his sudden death in 1985..
Called a ‘dynamic painter’, ‘calligraphic modernist’ etc by many writers/critics, a big development in the scholarship on Shemza’s work occurred only after Shemza’s wife and daughter decided to make his sketch books and other preparatory work public a few years ago. Shemza is known for writing detailed notes in both English and Urdu on his sketches. Most of the following citations from the sketchbooks have been included in John Holt’s essay and give great insights. In his essay, “Anwar Jalal Shemza A Search for the ‘Significant’”, John Holt terms Shemza’s experiences of being immigrant, shattering of dreams and aspirations, identity crisis as a human and an artist, confidence building, and the memory of their own cultures as “not unique” since so many other AfroAsians were going through the same. He has been called a resistive character. He felt the need to justify the authenticity of his experiences and being. Facing a dominant and ethnocentric value system, he continued to work. “Of course I knew my Pakistani heritage… But I had never utilised it. It never occurred to me that I could relate my Pakistani calligraphy and architecture to the painting problems I had… I am much more aware of my own heritage now than I ever was in Pakistan. You only became aware of the things you lose. This is the greatest contribution that England has made for me.” (Hand-written notes by Shemza on a sketch book). A wonderful edited catalogue by Iftikhar Dadi, on the occasion of Shemza’s Tate exhibition carried essays by scholars. Amongst them, Garfield has examined Shemza’s practice through the lens of landscape painting, while Dawood has opted for a holistic study concentrating on the critical issues of ‘belonging’ and ‘not-belonging’. A letter by Shemza included in Dadi’s piece might help to understand Shemza’s initial goals in life. . This is addressed to his Lahore-based friend and author Karam Nawaz in Sept 1960 when Shemza embarked on his journey home. “Whatever I have obtained in this country [England], it was solely for the sake of students in my country. I have tirelessly struggled to master the intricacies of artistic technique — this research was for the people of my nation who are anxious to benefit from Western experiments. But will I be able to convey this trust to them, I wonder? This is an aching question for which I see no clear answer.” Sadly, Shemza could not be accommodated into any art education institution. This is a period of reflection as old colonial attitudes dominating London’s art world for many many years are being challenged and art history throughout thre world is being rethought. An apt example of this re-thinking is showing of Shemza’s works at Tate Britain in 2015-16. “My grandfather didn’t get to see his work hanging in the Hayward or Tate, but I doubt he would have been surprised. He was a visionary and paved the way for artists of the future, including myself.”, Aphra Shemza, his granddaughter, a new media artist states. 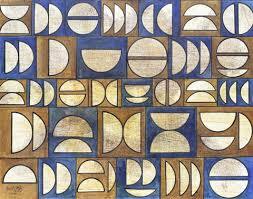 Shemza’s work was shown extensively in shows around the world in different biennales during and after his life too. His work is housed in some major galleries of the world today. In his re-discovery, I wonder, has Shemza, unknowingly, become part of an art history that he reacted against?